Award winning gym, art, dance, and music classes for kids make Kidville the #1 place for families with young children in Hoboken. Our classes and birthday parties help kids learn, play, and grow. Now enrolling for the 2019/2020 school year of Kidville University, our pre-school alternative program for children 2.0-3.3 years. Flexible half day and full day preschool schedules available. Find out for yourself why KVU is Hoboken’s most popular pre-school alternative program! Our program is emergent and STEM driven. Contact us at 201.377.5495 or via email at programdirector@mykidville.com for more information, to schedule a trial/placement or to schedule a private tour. (on 12th Street between Hudson Street and the River). Just be sure to tell the garage you are coming to Kidville. for up to 3 hours during the week and 2 hours on the weekend! Our Upcoming Winter 2019 schedule of classes begins January 2nd. 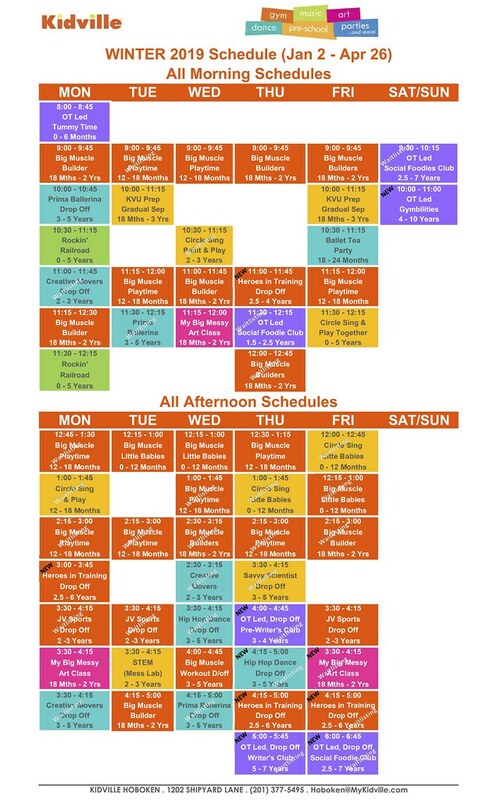 Scroll down to view the NEW posted schedule or click on the links for schedules by age!